to remain Independent and out of a Convalescent Home for life! Carol Heger is 60 year old single woman who was born with Spastic Diplegic Cerebral Palsy (CP). She has cared for herself all her life. She studied to be an Electrical Engineer in college before her mother passed in 1976. She worked full time as a Computer Programmer until 2000. She has worked for OptiFuse part time since then. She has fought all her life to remain independent, caring for herself, enjoying life, being active in her church, loving and encouraging others to do and be the same. With her CP, her muscles are extremely tight. She has had numerous surgeries and physical therapy (PT) all her life, as well as muscle loosening medications. Insurance will not cover the full amount of PT she has needed. It is too extensive, so beyond their allowable cap. About seven years ago, her muscles were so tight that she could barely stand and walk and care for herself. She was months away from life in a convalescent home. 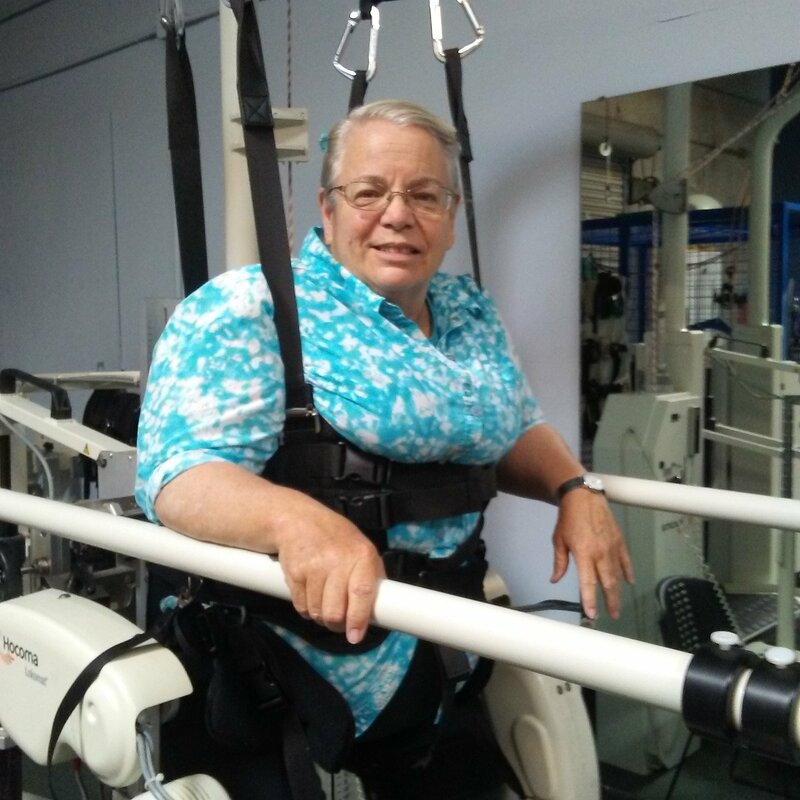 In April 2011 Carol found VIP Neuro Rehabilitation Center, her miracle facility! She started going 3 times a week for 1½ hours of therapy. The Lokomat is a miracle machine. It is an electronic treadmill that is connected to a computer in which Carol is harnessed from her torso down to her toes. The computer walks her, moves her legs and feet CORRECTLY, to stretch muscles and train them to walk NORMALLY again. She also gets physical therapy every session along with other equipment and exercises. After 3-4 months, many of her lost abilities were regained. She could now walk with her walker and care for herself again!!! Thank you VIP! But when she reduced her sessions to twice a week, she began losing some abilities again. Carol had to go back to 3 times a week…for life…to keep her independence. Carol has used most of her existing funds, including refinancing her home many times. She has found 2 sponsors who have helped her with the cost of the therapies for the last 3.5 years, so she currently only has to pay $550/month. But next year, all the funds she has saved will be depleted. This means that Carol must find even more donations, and sponsors, so that she can keep her independence! Will you please consider donating to Help Hope Live in honor of Carol Heger? The donated funds will be used to pay VIP Neuro Rehab Center directly for Carol’s therapies. Because they are non-profit donations should be tax-deductible. With your help, your tax deductible donations will allow Carol to continue her therapies at VIP Neuro Rehab. She will also be able to continue to work and go to church and help and encourage others to keep fighting and to keep smiling and enjoying life!!! She can keep her condo and remain independent. She can stay out of the nasty convalescent homes that really are poor environments for anybody!!! But especially for someone with a good and sharp and strong mind!!! Please help her!!! Family and friends of Carol Heger are raising money for the nonprofit Help Hope Live to fund uninsured medical expenses associated with Catastrophic Illness. Carol has chosen to fundraise for Help Hope Live in part because Help Hope Live assures fiscal accountability of funds raised and tax deductibility for contributors. Contributors can be sure donations will be used to pay or reimburse medical and related expenses. To make a tax-deductible donation to this fundraising campaign, click on the Give button.